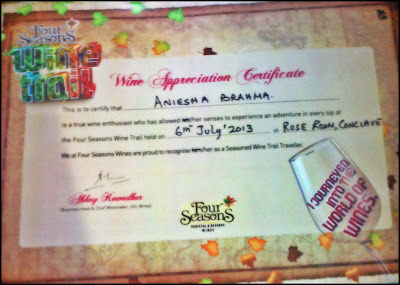 Four Seasons invited me to a structured Wine Trail this last Saturday (06.07.2013), organized by Ginger Claps. 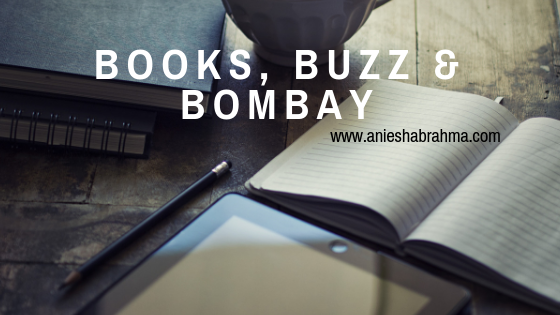 I came to know about this event through my friend and fellow blogger, Swarnali, of Dreams n Drama blog. 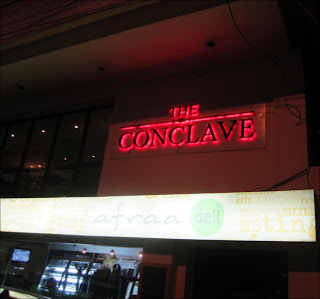 The event was held at the Rose Room in The Conclave from 3 pm to 6 pm. 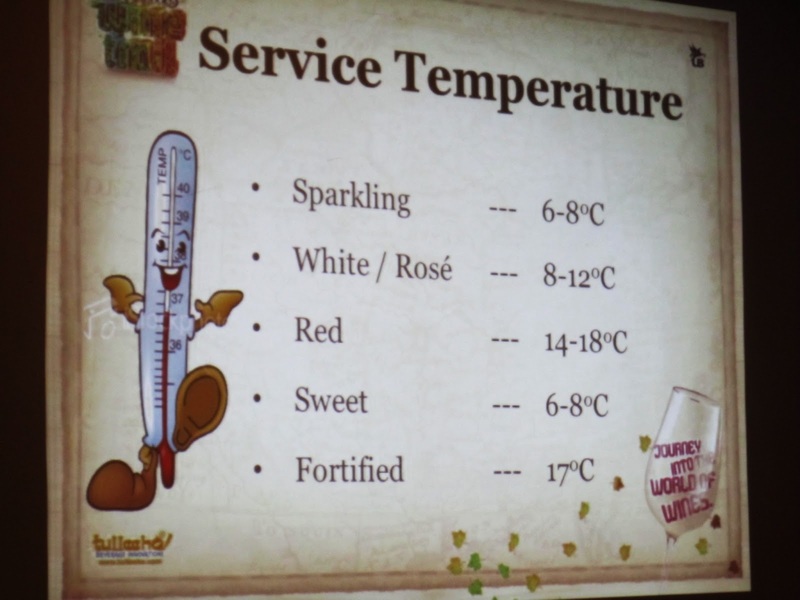 Our wine guide, Mr. P.K.K Mitter aka Peter talked us through not only how one ought to taste wine, but we learned how wine is manufactured in the first place. 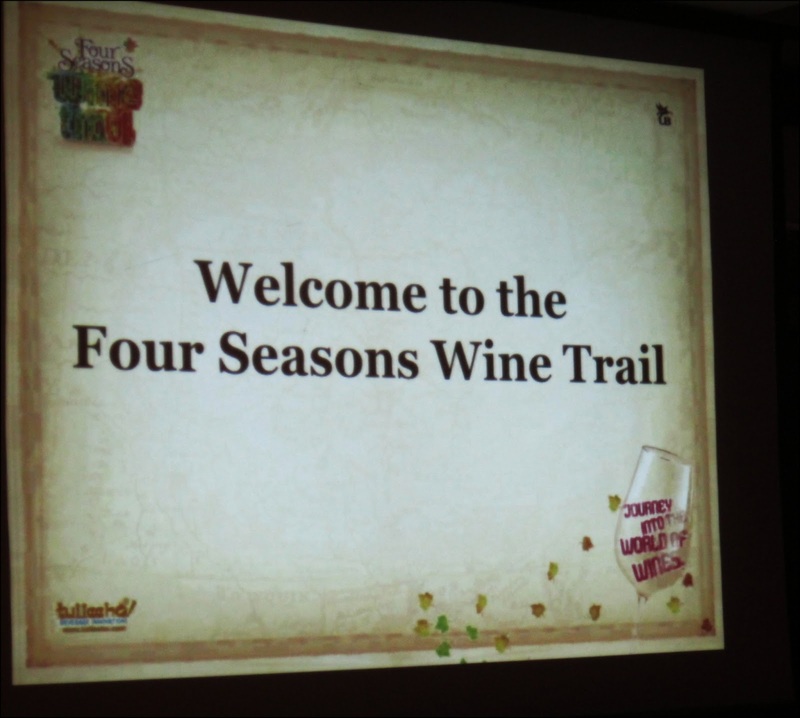 The two short AVs shown was an eyeopener for people like me, who are ignorant about wine cultivation. The first question he asked was, "What is wine?" The answer to which I got in a structure form that day, "It's an alcoholic beverage made from fermented grapes." The AVs showed us how the grapes are harvested, picked and then turned to wine, bottled, labeled and boxed, stored to be dispatched into the markets. 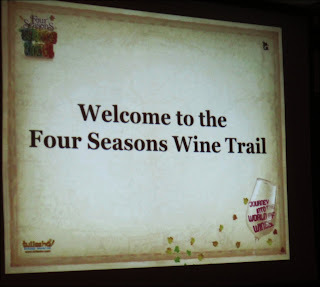 What was impressive was all this was happening in the state of Maharashtra - India's very own vineyard. Wine can be either Still, Sparkling or Fortified, depending on its content. It can be White, Rose’ or Red depending on its color. 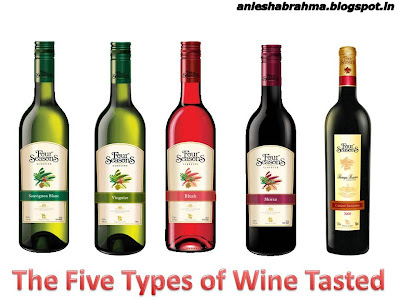 On the basis of its sweetness, wine can be dry, medium or sweet. 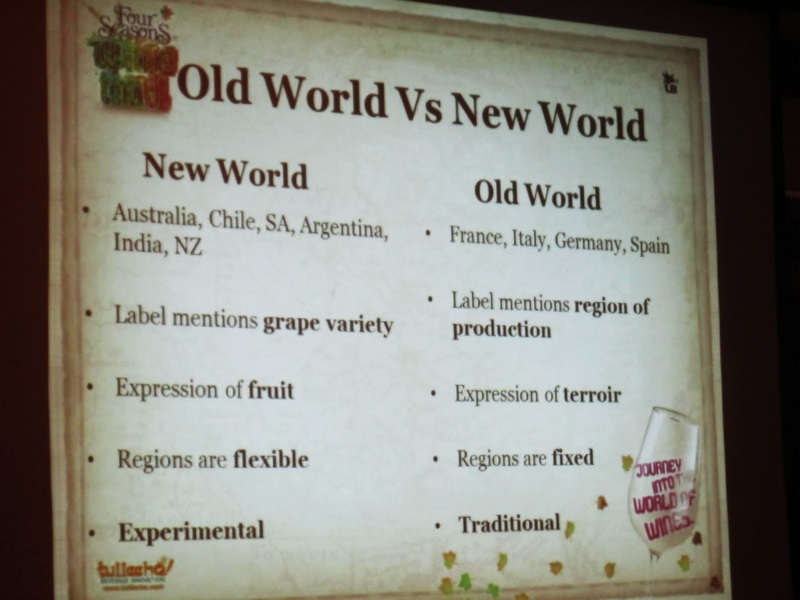 Wine can also be Old World or New World, and the label of the wine would tell one about it. 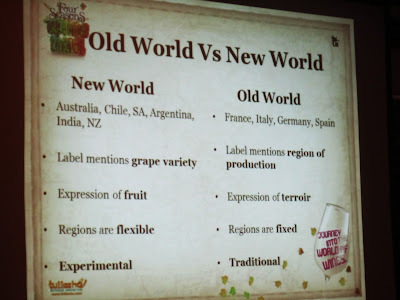 The Old World wines would have the terroir (region of origin mentioned) while the New World wines have the types of grapes mentioned. 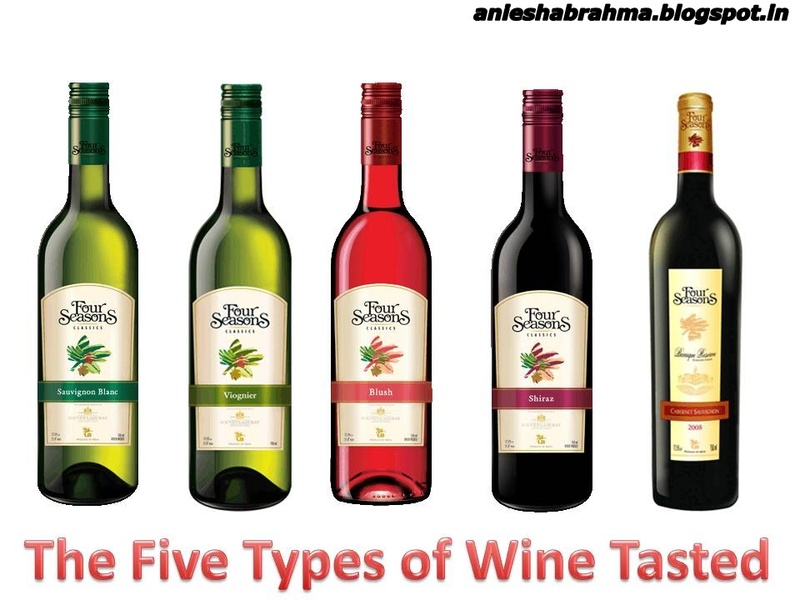 The different parts of the grape give the very different tastes to the wine: The stalks give the astringent taste, the grape skin provides the tannin color, the pulp supplies the sugar, the fruit acids and water, and the seeds give the bitter oil. We also learned there is a particular way to drink wine. Especially when one is trying to develop a taste for it. 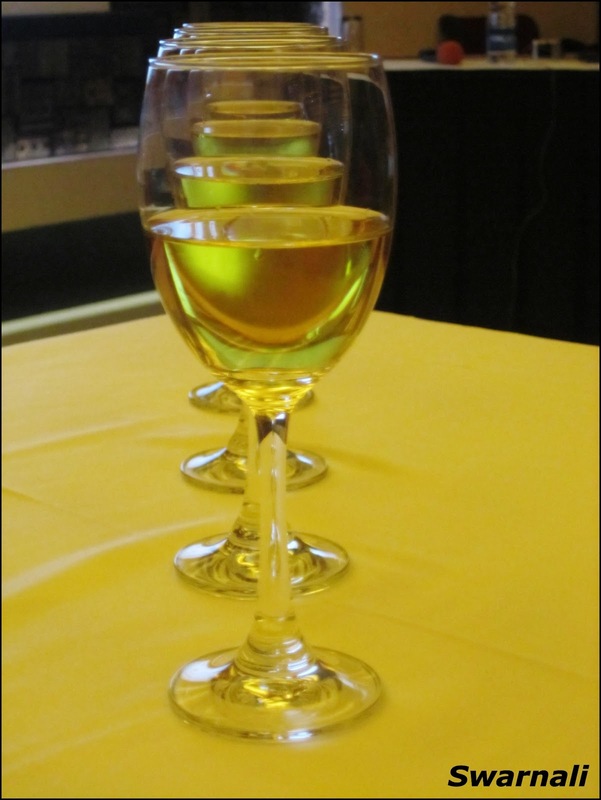 1.Wine should always be served in the wine glasses, filled to the curve....and the glasses should always be held by the stem. 2. 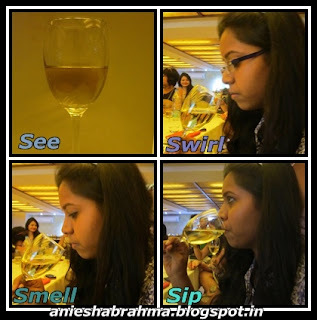 There are four S's to wine drinking: See, Swirl, Smell and Sip (illustration below). 3. It is also possible to find out if the wine is old or young, by tilting the glass and holding it next to a white mat. If the color is uniform, then the wine is old. If not, it's young. The five images above are taken from: http://www.fourseasonsvineyards.com/our-wines/four-seasons.html Click on them to enlarge the images and learn more! 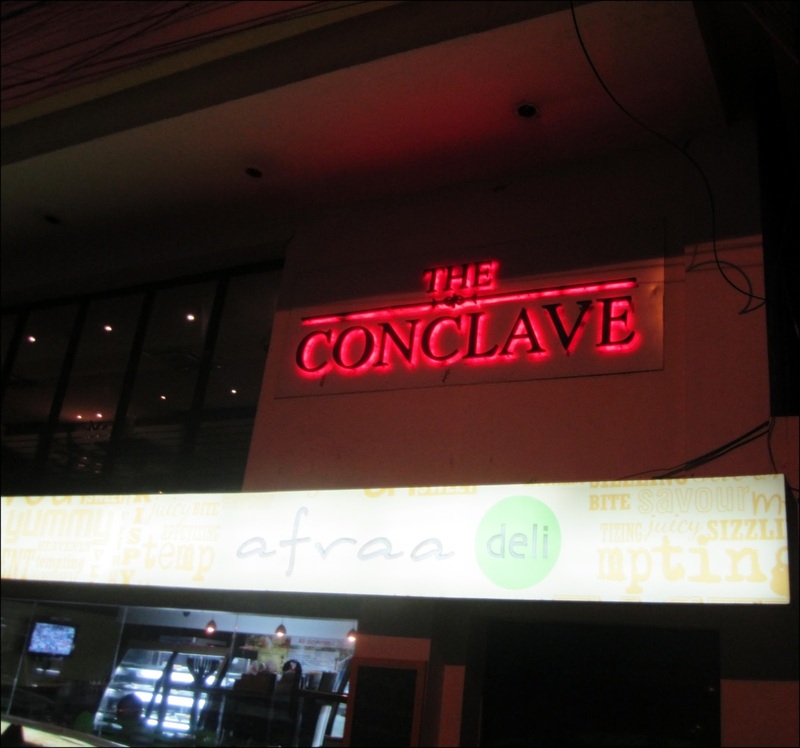 Indian Wine has finally come into the world market. 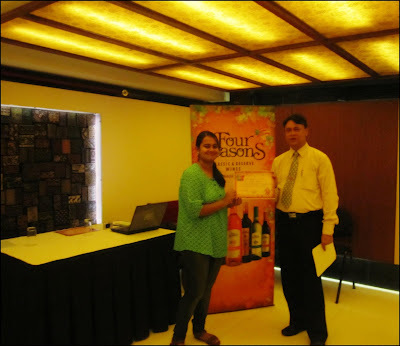 In fact the wines which are made here under the Four Seasons brand name, are being exported as "Ritu" i.e. season in Hindi. The event concluded with the awarding of Wine Appreciation Certificates, which I personally think is going to look great on my CV! 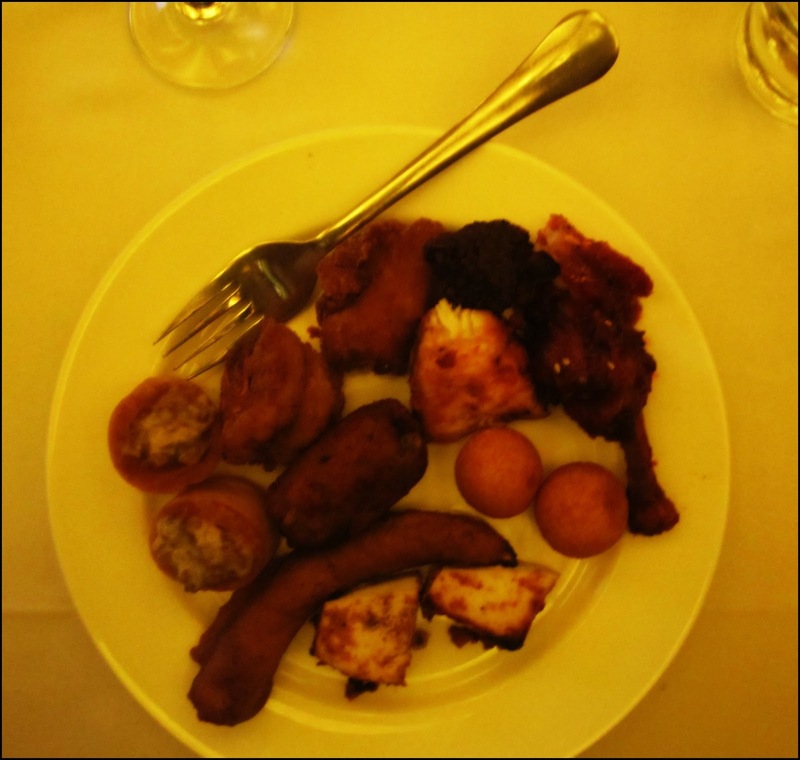 Such a lovely event it was! Thank you for your highly impressive & informative Blog:) Indeed I learnt a lot about qualities & varieties of the wine! Personally I like "Port Wine" though! 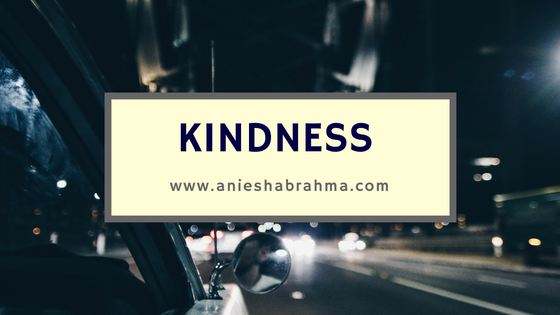 thanks sharing this. 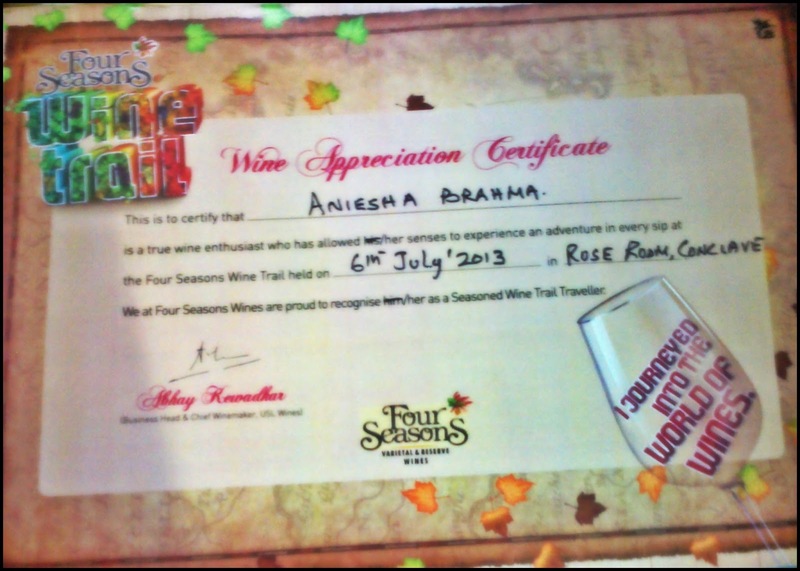 do they do this wine tasting event on a regular basis as I might be passing by Kolkata on my trip.